From MX to Mecha-Membrane, here's what you need to know. An essential part of any gaming rig is a great gaming keyboard, but not all mechanical switches are the same. The best mechanical switches for gaming are what makes the keyboard your trusty aide when you’re pounding your opponents in Counter Strike and commanding your army in Starcraft. With more switches now available in more keyboards, we've refreshed our guide to let you know what's what. Actuation Point: The distance at which the switch needs to depress to register as an input. Measured from the top of the keycap. Reset Point: The distance at which the key needs to rebound for the switch to reset. Travel: The total distance a switch can depress. Bottom-out: Pressing the key until it hits the bottom. 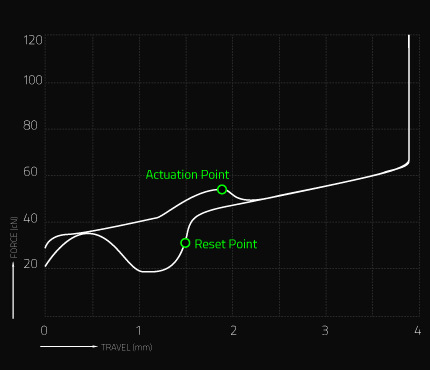 Hysteresis: When the actuation point and the reset point are misaligned. This is problematic because the switch needs to rebound higher than the actuation point for the key to reset. Debounce: In the short period that two metal contacts complete a circuit, multiple signals can be generated. This is called signal bouncing and is an undesired effect in mechanical key switches. Debouncing is a signal processing technique that ensures only one signal is registered. There are two core keyboard types: Mechanical keyboards have individual key switches and metal springs. Rubber dome keyboards—most modern, cheap keyboards—have a sheet of rubber that provides the resistance, tactile feeling, and registers the keypress to the computer. Mechanical key switches give an unmistakable, stronger feedback as you type in the form of feeling a bump, hearing a click, and/or feeling a smooth bottom out to the keyboard’s base. Not only does it feel more satisfying than a rubber dome keyboard, it can be more precise, too. In the early days, choosing a gaming keyboard meant a binary decision of going with either Cherry MX or membrane. That’s no longer the case. Instead, the market is now saturated with a ton of switches that offer a wide range of characteristics. The massive selection can be overwhelming even for a seasoned gamer. We’re hoping to make that decision a little less daunting with our keyboard switch guide. If you don't care much about the mechanics of mechanical keyboards and just want to know what to use for gaming, or you want to use your new-found smarts to pick up your next keyboard, here are the best gaming keyboard options right now. And here are the best mechanical keyboards. Keycap. The plastic top cap with the letter printing. Switch housing. The case that holds all the components together. Slider. The slider pushes against the spring and interrupts the connection between the metal contact leaves mounted on the side off the switch. Metal contact leaves. These are what registers a keystroke when they strike one another. Spring. The spring wraps around the base of the slider and pushes the switch back into its resting position after release. Linear. The keystroke is consistent and smooth. Tactile. A bump in the middle of travel, usually around the actuation point. Clicky. A bump in the middle of travel accompanied by a sharp “click” sound. No matter which type of switch you pick, mechanical keyboards are well-suited for playing PC games because they offer unmistakable feedback when pressed. That said, part of the fun of mechanical keyboards is getting one that perfectly suits your needs, and for that, you need to find the switches right for you. With tactile and clicky switches, you have confirmation every single time you type that what you pressed is registering on the computer, with feedback in the form of a click or the feeling of the bump when you hit the actuation point. The actuation point is when the keystroke is registered on the computer. This means that the gamer doesn't have to press down fully to get the keystroke to register, leading to faster typing. This can be useful in game types such as RTS where your Actions Per Minute can play a factor in winning. If you’re into faster-paced game types such as first-person shooters, linear switches may give you an edge. Because there is no dome to compress or a click to overcome, you can press the keyswitch faster and register keystrokes faster. Mechanical keyboards are also much more durable than rubber dome keyboards. For example, Cherry MX switches are rated to a lifespan 20-50 million keystrokes depending on the switch type. Rubber domes are rated to last 5 million. First released in 1983, the Cherry MX switch family is arguably one of the most successful keyboard switches ever made. Each switch type in the lineup is marked with a distinct color to reflect its characteristics. Recommended for: Gamers looking for fast action with minimal resistance. There isn’t a tactile bump in the middle to overcome. But for this exact reason, the Cherry MX Red may not be ideal for typists as it lacks that tactile feedback. Recommended for: Fast-paced gaming with more resistance than Cherry MX Red. The linear characteristics of Cherry MX Blacks make them ideal for spamming in fast-paced titles. Since the slider is a single piece, there’s no hysteresis. Recommended for: Primarily typing. The Cherry MX Blue has a distinct “click” sound when depressed beyond the tactile point, making it the loudest switch in the Cherry MX family. The Cherry MX Blue’s separated slider construction also provides the highest tactile feedback out of all Cherry MX switches. With that said, the two-piece slider construction also introduces a very pronounced hysteresis, making rapid firing a bit more challenging than linear switches. Recommended for: Fast-paced gaming. The Cherry MX Speed is the only switch in the Cherry MX family that isn’t categorized by the color of its stem (It’s grey, in case you were wondering). Cherry most likely produced this switch to compete against the newer switch types with a higher actuation points. Kailh, also known as Kaihua Electronics, is a major China-based switch manufacturer. Since its founding in 1990, the company has expanded its presence all over the globe. Not only do its in-house Kailh switches compete directly against the Cherry MX, Kaihua also build custom switches for peripheral partners. Commonly referred to as “Cherry MX clones”, the Kailh switches are identical to Cherry MX in design. They even have the same characteristics corresponding to the same color schemes. As such, keycaps designed for Cherry MX stems are also compatible with Kailh switches. It’s almost impossible to search for gaming anything without bumping into Razer. In 2014, Razer teamed up with Kaihua to develop the Razer mechanical switches, which were then promptly installed on the Razer BlackWidow series of gaming keyboards. Since then Razer has developed its own production lines for the switches, with multiple manufacturers producing them, including Kaihua, Greetech, and possibly others. There are currently two primary versions of the Razer switches in circulation: Razer Green and Razer Orange. Recommended for: Primarily typing and gaming. The actuation point is slightly higher than that of the Cherry MX and Kailh. Other than that, its behavior is nearly identical to that of Cherry MX Blue and Kailh Blue. 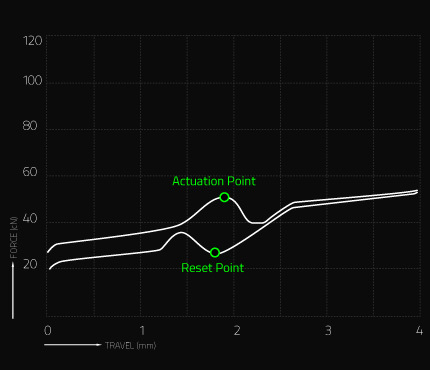 Razer claims that it was able to reduce hysteresis by shortening the distance between the actuation and reset points to 0.4mm. Recommended for: Gaming and typing. The Razer Orange is almost a carbon copy of the Kailh Brown. It has a silent tactile bump and a single-piece slider design. Recommended for: Gaming and typing. Razer’s newest opto-mechanical switch is identical to the Bloody LK Libra Orange. Razer claims that it enforces a strict QC process for its clicky optical switches. It’s currently only available on the Razer Huntsman and Huntsman Elite keyboards. Recommended for: Gaming and typing. Razer’s Mecha-membrane switch is proprietary to the company and comes in its Ornata Chroma keyboard. Razer combines both membrane and mechanical technologies into one switch, claiming that you get the best of both worlds. What Razer means is, you get the soft land of a membrane keyboard combined with the the tactile feel of a clicky mechanical. Logitech developed its Romer-G switch in partnership with Omron, a prominent Japanese electronics manufacturer. Currently, the Romer-G switch is only available in the Logitech G810 Orion Spectrum and the G910 gaming keyboards. The Romer-G switch was designed from the ground up to overcome some of the flaws in mainstream mechanical switches. The Romer-G’s actuation point is set at 1.5mm, 25% shorter than the 2mm actuation point on Cherry MX and Kailh. It features a set of redundant contacts that not only ensures every keystroke is registered, but also extends its life expectancy to 70 million keystrokes per key. There’s a very subtle tactile bump at the actuation point that’s almost unnoticeable during intense gaming. The center of the switch is carved hollow to make room for a surface-mounted LED and a light guide for a more vibrant, even lighting. Recommended for: Fast-paced gaming. The Romer-G’s short travel distance plays a huge role in improving the rate of repeating keystrokes. The reset point is closely aligned with the actuation point so there’s no hysteresis. Recommended for: Gaming. Building upon the legacy of the original Romer-G tactile, the Romer-G linear removes the tactile point and further enhances the actuation speed. Recommended for: Typing. Unlike the Romer-G switches, the clicky GX Blue employs a traditional mechanical key switch design. Both its internal mechanism and behavior are identical to that of the Cherry MX Blue. It is, however, still rated to last for 70 million keystrokes per key, just like the Romer-Gs. SteelSeries turned to Kaihua to develop the fastest switch possible. What emerged from their partnership is the QS1, a switch that first made its debut on the SteelSeries Apex M800 gaming keyboard. The QS1 has a similar structure to the Logitech Romer-G. A spring sits in the hollow center, providing the support for the keycaps. At the base of the switch is a surface-mounted LED, but it lacks a light guide. Recommended for: Fast-paced gaming. The short total travel distance helps the keys rebound quicker after bottoming out. The light actuation force and higher actuation point makes spamming easy. Recommended for: Gaming and typing. The speedy and tactile Topre switch makes it ideal for general use. Although there’s a tactile bump at the actuation point, there’s no hysteresis to overcome since the switch is capacitive. Cooler Master uses Cherry MX switches on all of its keyboards—except for one. The Cooler Master Novatouch TKL, the most esteemed plank in Cooler Master’s inventory, uses Cooler Master’s proprietary Hybrid Capacitive switch. The Cooler Master Hybrid Capacitive switch is basically a modified Topre. It adds Cherry MX stem to the center of the Topre stem, giving users the flexibility to install custom keycaps. Recommended for: Typing and gaming. The Hybrid Capacitive switch behaves identically to Topre. Cooler Master claims that it has an actuation point of just 1mm, which is 1mm shorter than the 2mm actuation distance on the normal Topre switch. Bloody has had a long tradition of using optical switches for its high-end gaming keyboards. Optical switches detect a keystroke when a laser under every switch is interrupted. Because they don’t rely on metal contacts, there are fewer moving parts and fewer potential points of failure. Recommended for: Gaming and Typing. Unlike traditional clicky mechanical switches, the LK Libra Orange doesn’t rely on a two-piece housing to produce the click. By keeping the tactile mechanism and actuation mechanisms separate, hysteresis is reduced to nearly zero. Each switch also has its own stabilizing bar to reduce key wobble during depression. Fans of Cherry MX Blues looking for a lighter, more responsive alternative should definitely give this switch a try. Recommended for: Fast-paced gaming. The Bloody LK Libra Brown is the linear counterpart to the LK Libra Orange. It offers an alternative to gamers who want the benefits of the LK Libra optical switch without the noise. Roccat is a mechanical keyboard veteran, but it’s fairly new to the proprietary switch deal. Despite the seemingly lack of experience, its first venture – the Titan mechanical switch – is damn impressive. In addition to carefully tuned actuation characteristics, the Titan is able to reduce switch bouncing and register keystrokes sooner due to the use of higher quality components. Roccat also pairs the switches with ultra-thin, lightweight keycaps. They help to reduce the weight the switch has to push against to bounce back. Recommended for: Gaming and Typing. The tactile and silent Titan feels like a heavier version of the Cherry MX Brown. It wobbles much less than a standard mechanical switch. The wobble-free travel significantly enhances the responsive feel. Tesoro employs a wide range of low-profile mechanical switches for its Gram series low-profile mechanical keyboards. Recommended for: Gaming. The Tesoro Agile switch is identical to the Kailh PG1280 switch. In addition to having a shorter 3.5mm travel, its switch housing has been reduced in height as well. This allows for thinner, more flush keyboard designs. Recommended for: Typing. This TTC-made ultra-slim mechanical switch is even shorter than the Tesoro Agile. With a super-thin casing and actuating at just 1mm, it helps to cap the height of the keyboard to a mere 24mm. With that said, I’m hesitant to recommend the Tesoro ultra-slim Blues for gaming due to its terribly inconsistent actuation point distance. Recommended for: Fast-paced gaming. The Tesoro Slim also comes in a linear Red variant. If you’re okay with using flat chiclet keys, then the speedy 1mm actuation distance could help you spam in game. Matias of Canada produces three of their own Alps-mount switches and a few keyboards. Matias switches are clones or derivatives of the Alps Electric Corporation switches produced up until around 1996. Alps-mount switches have a high actuation point compared to Cherry MX switches. Matias produces quality keyboards, offers many of their parts for sale, and are involved in the enthusiast DIY community. Recommended for: These are tactile switches so a lot of the same ideas from the MX Brown section can be applied here. These switches have hysteresis just like Browns too. However, the actuation point on the Matias switches is much higher than MX switches. If you learn a soft touch, you can type and input commands even faster. Recommended for: These are linear switches, so a lot of the same ideas from the MX Red and Black sections can be applied here. These switches don’t have any hysteresis. However, the actuation point on the Matias switches is much higher than MX switches. If you learn to not bottom out, you can type and input commands even faster. These switches are the second lightest switches on the list, meaning the force needed to press down on the keys is very low. The membrane/rubber dome switch is the most common type of keyboard switches. Its simple structure and low cost makes it an ideal solution for budget keyboards. The principle behind the rubber dome switch is simple. When the key is pressed, the rubber dome underneath depresses to complete the circuit on the PCB below. The electric signal is then allowed to pass, signaling a keystroke. Because the circuit is printed on the PCB, the switch must be bottomed-out for the keystroke to activate. Being a budget product, the membrane switch has a significantly shorter lifespan compared to mechanical switches—lasting only 5 to 10 million keystrokes on average. It’s also notorious for becoming “mushy” as it slowly degrades due to wear. The scissor switch is a variation of the rubber dome that’s commonly used for laptops and low-profile keyboards. The keycap sits on top of two pieces of crisscrossed plastic stabilizers. It has a much shorter travel than that of the traditional rubber dome. Recommended for: Gaming and typing on laptop or on a budget. Gateron is a Chinese manufacturer which makes MX-stem switches. Like Cherry, they have a range of different switch types which are classified by their stem colors. The enthusiast community has recently seen an influx of these switches and some say they favor the Gateron Clear and Black linear switches. These switches were made by Alps Electric Corporation from around 1983 until 1996. They are referred to as complicated Alps because they are comprised of 9 different parts. Like the rest of the switches on the list, they are differentiated by their stem color. Complicated Cream Alps serve as the basis for the Matias Quiet Click key switch. Like the Matias switches, they have a square stem, instead of a cross shaped stem like the MX-mount. Just like Matias switches, SKCL/SKCM switches also feature a higher actuation point. These switches are found in vintage keyboards. There is no such thing the best switch for gaming. While it’s generally agreed upon that mechanical keyboards offer superior durability and performance, the choice of what to purchase depends entirely on your preference. We’ve seen professional StarCraft players excel using keyboards equipped with Cherry MX Blues. We’ve also seen Counter Strike players dominate using membrane keyboards. So try out the different switches to see which flavor suits your fingers the most.